I’ve been meaning to visit the RWB workshop since last year but I never got around to doing it. It’s not like I didn’t want to go, trust me I did, it was more than I never had the time or the means to go. It’s quite far from the centre of Tokyo. It’s actually in the last assuming place you’d think to find a place that’s home to some of the most extreme machinery known to man. So when I had the very economical and very sensible BMW 225xe Active Tourer on test, I thought this was the perfect opportunity to visit RWB. Sort of. The visit itself to Kashiwa, Chiba wasn’t actually for RWB. It was for something else (more on that in another story). It just so happened that I realised RWB wasn’t too far from where I was going so I thought why not pop by and see what it was like. I’ll have to visit again to do a proper feature on them, and actually ask some questions because time I was too busy with my jaw on the ground to even think about anything else. I just had to take it all in. It was like visiting a sacred temple or something. You just had to pay your respects. As I arrived at the workshop I knew I was at the right place. There’s no big ‘RWB’ signage or anything like that. No, I was able to tell from the dozen cars parked outside. 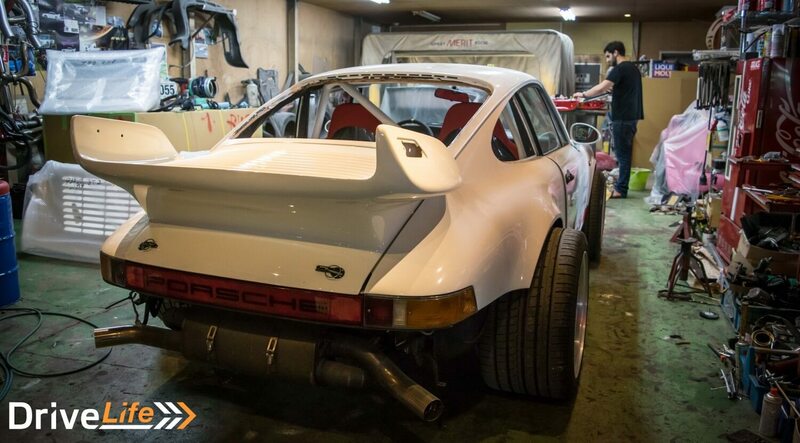 There’s no better way of letting people know where they are than some distinctive widebody Porsches. I can only imagine what living around here must be like. After a quick look on Google and it saying the shop was closed on Wednesday, it was great timing to see my mate Nate outside. He took us inside to have a look at the workshop and some of their current projects. 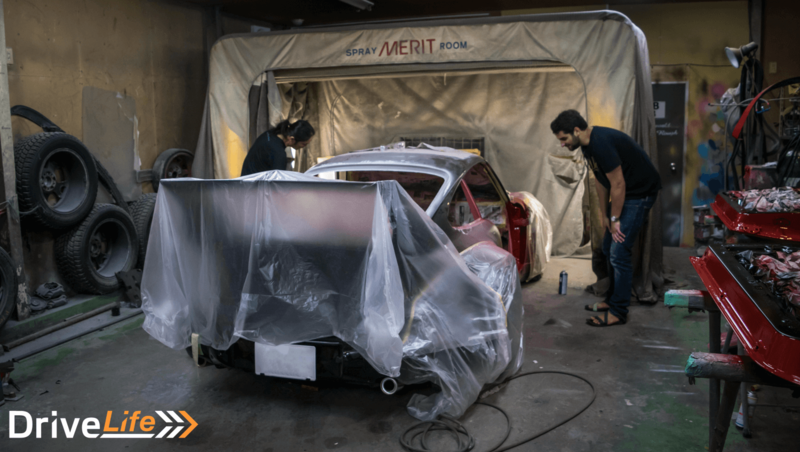 There was a a red car which had just been sanded down bare and will soon be repainted. The pink car, called ‘Veronica’, was in for repairs after being involved in an accident during a recent race at Tsukuba circuit. My eye caught a white 964 with red ‘Carrera RS’ decals on the side. It had been fitted with the wider wheels but no arches to cover them up yet. It gave an idea of just how much wider these cars are than a standard 911. 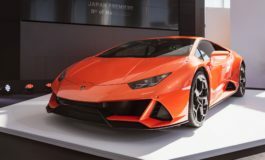 Apparently this car has been in the shop for a few week since Nakai-san has been busy building other cars around the world. But it really is true what they say; the best things are made in sheds. 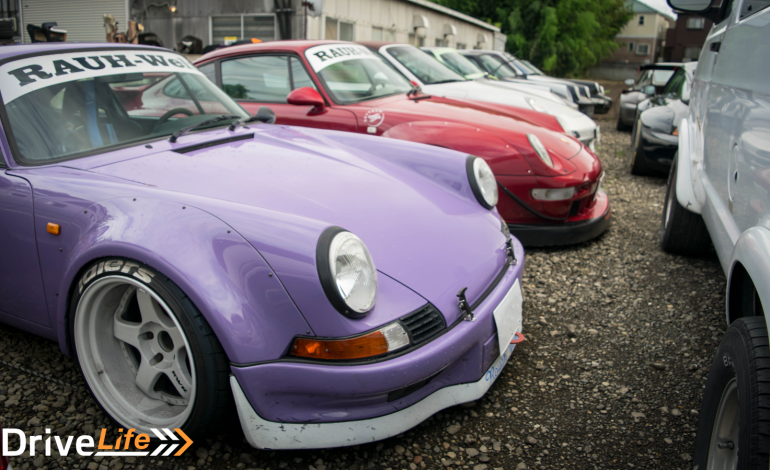 RWB cars are no different. They’re made in shed by human beings, not robots. 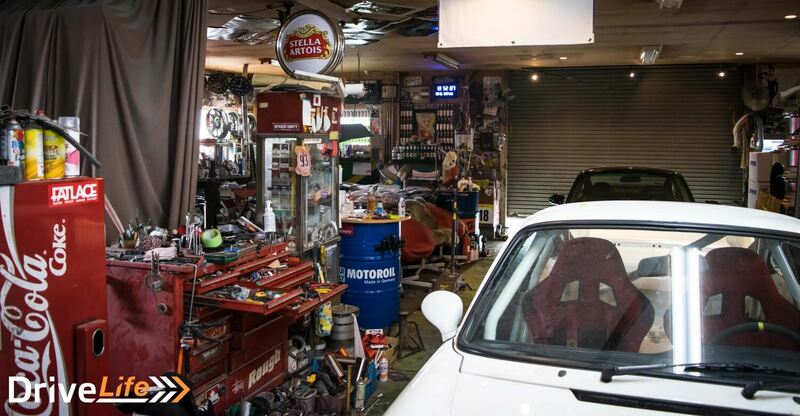 While I haven’t been to Liberty Walk yet, the RWB workshop felt more bare down and laid back than theirs. It was more a man-and-shed feel than the high-cost facility of LB. 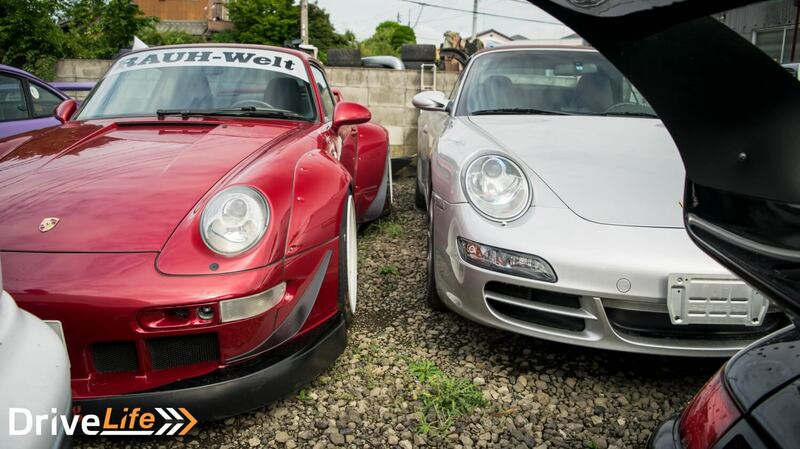 Compared to other workshops I’ve been to, for example Spoon and NISMO, the RWB workshop was refreshingly characterful. 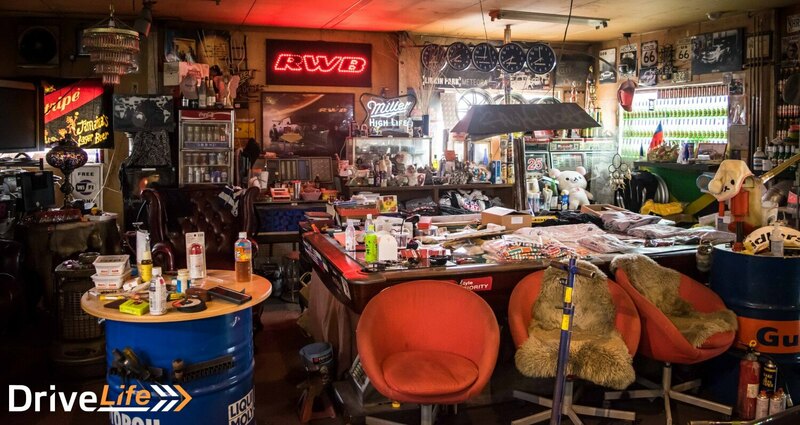 It wasn’t some kind of scientific, hermetically sealed, pristine workshop. There bits and pieces all around the place. It looked and felt like it had soul. Looking around the workshop was like a motoring version of ‘Where’s Wally’. Bits and pieces of things of cars, automotive paraphernalia, and other knick knacks were scattered around among the wings, flared arches, and other RWB parts. I particularly liked the lounge area which looked like the manliest to man caves. Scattered around were half-empty cigarette packs, discarded cigarette butts, beer bottles, high caffeine drinks, and something called a ‘CD’. Everything one needs to spend 3 or so days building a widebody masterpiece. Outside were some examples of RWB’s creations. The mint green car was another car saved from an accident where it fell off a crane but has been brought back to life since then. Most of the cars outside belong to the shop, so no need to worry about customers complaining that their cars have been left out in the elements. 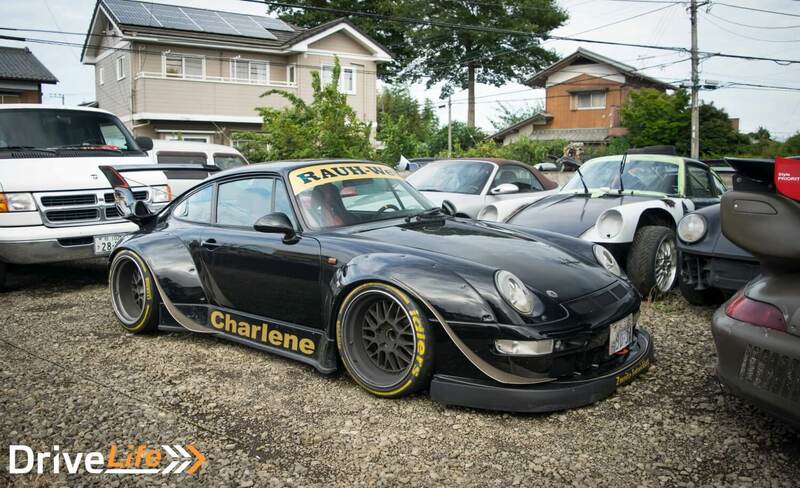 Some of Nakai-San’s race cars were also out there, the black and olive coloured 993s. Curiously there was a 997 Cabriolet outside. Perhaps the base of a future project? One can hope. A huge thanks to Nate for showing us around and I do hope I’ll be able to go back and meet Nakai-San there. Watch this space. By car: About a 70 minute drive from the centre of Tokyo. By train: 68 minute train ride from Tokyo Station to Sakasai Station. The easiest way to get there would be by car but the nearest train station is Sakasai Station. The workshop is about a 15 minute walk from there. Hope that helps. Loved this write up about RWB. 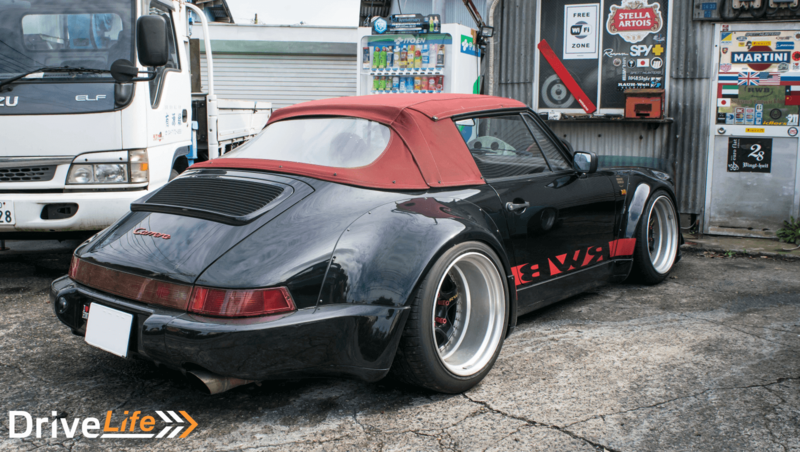 My third trip to Japan and TAS is coming upon January and one shop I haven’t visited yet, surprisingly is RWB. But are they happy to allow you to look around the workshop and the cars or is it better to email in advance incase they aren’t very visitor friendly ? Hey Ken, nice write up! 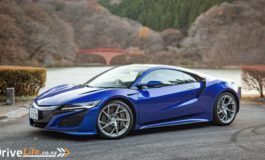 I’m visiting Japan in a couple months and was wondering, do I need to make an appointment to visit the shop or can I just drop by? thanks! !